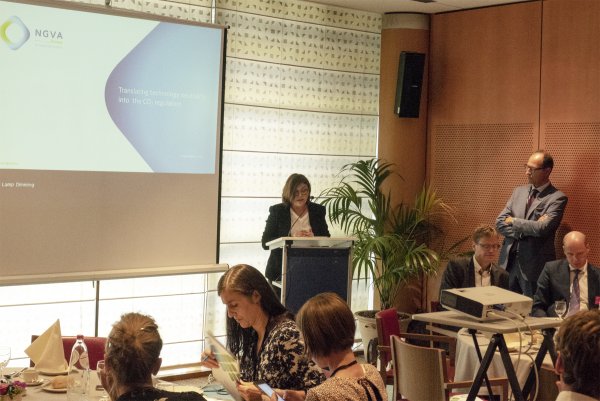 Organized by NGVA Europe and hosted by MEP Adina-Ioana Vălean, chair of the ENVI Committee of the European Parliament, the lunch event ‘Securing technology neutrality in the CO2 standards Regulations’ took place on 5 September 2018. Ahead of the final vote in the ENVI Committee on the CO2 standards for passenger cars proposal and upcoming debate on the related file for Heavy Duty Vehicle, MEP Adina-Ioana Vălean together with NGVA Europe Secretary General Andrea Gerini and Dr. Björn Fredriksson Möller, Business Development Analyst at E.ON, the participants discussed how to ensure Technology Neutrality and the Circular Economy thanks to the use of natural and renewable gas in mobility. Natural gas is becoming a more and more attractive fuel for many market players, increasingly coming from renewable sources. Last year Europe accounted for a renewable gas production of almost 2 bcm, able to cover the need of the vehicles currently driving on gas across European roads. The deployment of NG vehicles is expected to grow in the next decade more than ten times, reaching around 13 million vehicles. At the same time, this would draw the consumption of sustainable renewable gas, estimated to reach one third of it. The growing attention of the market must be supported by a careful decision of policy makers. They must ensure that its contribution to mitigate climate change is adequately and fairly considered into the European legislation. In this respect, the new proposals setting CO2 emissions performance standards for passenger cars and lorries should introduce a comprehensive approach for assessing the environmental benefits of all mobility solutions, especially considering the role that renewable fuels can play in decarbonising transport emissions. For this reason, NGVA proposes the so called ‘CO2 Correction Factor’ methodology to concretely translate technology neutrality into the CO2 standard regulation, enabling the correct assessment of the impact on climate change from the use of renewable fuel.